Sit on the side of the mountain, between the principal dock and the village center of Taiohae, the Pension Mave Mai offers 8 comfortable rooms, located in a two floors building. Each room is equipped with A/C, private bathroom and private terrace. Every morning, the breakfast is served on the main terrrace of the building with a stunning view of Taiohae Bay. Several restaurants are located in the village center near the pension. The pension Mave Mai is located 48-Km away from Nuku Hiva airport. 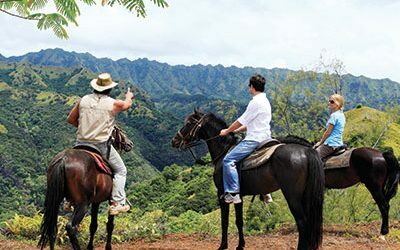 The transfer between the airport and the pension will introduce you to the diverse landscapes of the Marquesas Islands. Moreover, you will have to walk only 5 minutes from the guest house to enjoy the beach of the village.